Forest bat populations are rapidly declining, and one or more species may soon be reclassified as endangered. If reclassified, the U.S. Fish and Wildlife Service provides the opportunity to develop a Habitat Conservation Plan (HCP). An HCP helps endangered species recover by conserving their habitat during land management activities. In preparation, Minnesota and neighboring states are developing a forest bat HCP that will maintain bat habitat and allow important forest management activities to continue. This page will keep you informed on the status of the HCP, share opportunities for involvement and gather your feedback as the plan is developed. Fast-moving white-nose syndrome is increasing the likelihood that the federally threatened northern long-eared bat and other bat species will be reclassified as endangered in the near future. The Minnesota, Wisconsin and Michigan Departments of Natural Resources are developing a joint, large-scale HCP. The HCP describes the costs and benefits of forest management for bats, and details conservation measures to offset forest management impacts on bats. Minnesota forest land owners—public or private—may participate in the ITP and have their woodlands covered by the provisions of the HCP. They have the option to develop their own HCP through the U.S. Fish and Wildlife Service, if desired. The HCP integrates forest practices with conservation measures to support bat populations. Input from forest land owners, forest managers, conservation groups and other stakeholders is essential to developing an effective HCP. Provide your comments and suggestions: we want to hear from you. The DNR is seeking input on draft chapters of the HCP as they are developed. Chapters One, Two and Three are now available. Submit a feedback form Wednesday, July 25, 2018 to let us know your thoughts. View the introductory webinar. This 24 minute video provides background and details about the HCP process, next steps and how you can participate. If you need an accommodation for the webinar, contact Kerstin Larson at 651-259-5562 or email [email protected]. The U.S. Fish and Wildlife Service has more information about other steps you can take. Why should I care about Minnesota's forest bats? Bats are a critical component of a healthy ecosystem. A bat can consume its weight in insects every night, reducing the need for agricultural pesticides and decreasing mosquito populations. White-nose Syndrome (WNS) is causing dramatic declines in bat populations of Minnesota and across the country. Many forest bats are imperiled because of this disease. Forest management activities benefit bats and other wildlife, while maintaining healthy forests and generating income for landowners and timber companies. Many of Minnesota's bats spend spring, summer and fall in the state's forests, where they spend their days roosting in tree cavities and crevices, and under loose bark. Female bats give birth to young while in these tree roosts. Before they are able to fly, young bats may be vulnerable to the effects of normal forest management activities. Minnesotans want healthy bat populations that have access to the habitat they need to thrive and reproduce. Why does Minnesota need a forest bat Habitat Conservation Plan? In response to the effects of WNS, in 2015 the U.S. Fish and Wildlife Service designated the northern long-eared bat as "threatened" under the federal Endangered Species Act. The 2015 designation included special provisions to allow for continued management of forest habitat. If Minnesota's forest bats continue to decline as expected, they will likely be reclassified as "endangered." If that happens, the special provisions will no longer be available. Once designated as endangered, an Incidental Take Permit (ITP) will allow for otherwise restricted summer forest management to occur. The U.S. Fish and Wildlife Service can issue an ITP only if the applicant develops a Habitat Conservation Plan (HCP). The HCP describes the costs and benefits of forest management for bats, and what conservation measures will be implemented to offset impacts of forest management on bats. The HCP integrates forest practices with conservation measures that support bat populations. What is the DNR's role in the Habitat Conservation Plan? The Minnesota DNR is partnering with the Wisconsin and Michigan DNRs to develop the Lake States Forest Bat Habitat Conservation Plan. As a forest land owner, the Minnesota DNR will benefit from the HCP since the HCP will allow the Minnesota DNR to apply for an ITP. The DNR will extend the same opportunity to other land owners as a public service. A federal grant to the three states is paying for development of the HCP. 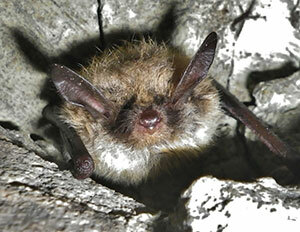 DNR experts in bat conservation and forest management are guiding development of the HCP. As a forest land owner, what do I need to know? If any of Minnesota's forest bats are reclassified as endangered, forest landowners will need to consider the effect of their activities on the bats. Participation in the HCP is voluntary,but is one way to ensure that a landowner's forest management activities can be conducted without impacting endangered species. Participants will know they are complying with federal regulations and will provide conservation benefits to bat species while managing their forest. Please email comments and suggestions to [email protected]. All comments will be read and considered.